In the final hours of his term, Sen. Jeff Flake of Arizona introduced carbon tax legislation because “Republicans need to get serious about climate change”. The inspiration for this deathbed wish is none other than the climate change report funded by Tom Steyer, George Soros and other radical green groups. He’s a veritable Thomas Moore of the Senate. 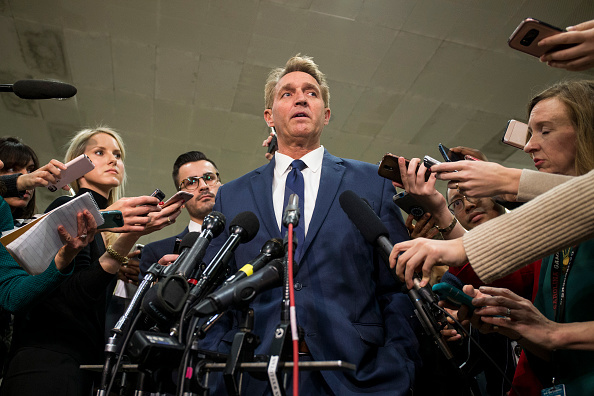 Flake has a history of introducing carbon tax legislation. He did so in 2009 as a Congressman. So unpopular was that proposal that even with a veto-proof, Democrat supermajority in the Senate, then Leader Harry Reid did not even bring it to the Senate floor for a vote. So unpopular was that legislation that the Democrats would go on to lose 63 seats that following election. Unfortunately, Jeff Flake wasn’t one of them. Power The Future was started to fight for energy workers: those men and women doing their job, working difficult, technical, sometimes dangerous jobs who seem to have little say over their employment and their future. Green groups with enormous donors like Bloomberg and Steyer and Soros are constantly threatening their employment, their community, and their way of life. But so too are aloof, arrogant policymakers who are too obtuse to see the consequences of their feel-good legislative initiatives. Had Jeff Flake paid attention to his own state of Arizona he would know a similar carbon tax (the most expensive ballot initiative in the state’s history) which was funded exclusively by Tom Steyer was recently rejected by 38 points. Yes. You read that correctly. The final vote was 69% opposed to 31% in favor. You’d think Flake would have his finger on the popular pulse in Arizona. Such overwhelming disapproval is roughly the same percentage of Arizonans disapprove of him. Someone gives this man a poll. But no. Much like Steyer and his billions, much like the jet-setting UN Crowd and their carbon-emitting, hypocrisy -filled global conferences, much like the “practice what you preach” Bernie Sanders, soon-to-be FORMER Senate Jeff Flake will force unpopular, job-crushing legislation on you because he thinks he knows best. Coal workers be damned. Energy independence be damned. Cost of living be damned. We at Power The Future are glad to see Sen. Flake and his terrible ideas enter into retirement, and we wish him well on the desk at CNN.